When disaster strikes, our Fresenius Medical Care team stands together to ensure the safety and well-being of our staff so they can continue providing life-sustaining care to our patients. A beautiful example of this is captured in a letter from our Clinical Manager in Panama City, FL. Kathy Shonk experienced first-hand the important work of our Disaster Recovery Team. I had started this letter soon after Hurricane Michael, I am going to add to the story now that several weeks have gone by, please allow me to express my gratitude in this way as I am giving thanks and this is also a part of healing. As the Clinical Manager of the Panama City clinic I just wanted to take a minute to express my gratitude. Scott Riddel and his recovery team have been so supportive. I know what they are doing is the “Fresenius Way,” however, they are doing it with such love and compassion that means so very much. No words could ever express my gratitude. They are doing all the “grunt” work so that I can focus on my staff and my clinic, which has enabled us to start providing care to every patient that needed it. And the love we are giving to the patients, omg, it is beyond words, and we can only give that love because we are getting it from you. Fourteen of our staff members have either lost their homes completely or are unable to live in them, and your support staff has made sure they are housed somewhere. That means so much, as I feel I have the most wonderful staff and I care for them so deeply. I had evacuated from my home on the beach and gone to a hotel about a mile from the clinic, and as the storm crossed over I watched everything outside disappear. The walls of the hotel were literally bowing. The next morning, I immediately went to our clinic with my husband, dog and cat in tow, couldn’t drive all the way there so my husband and I walked the rest of the way around downed power lines and trees, total devastation everywhere. However, there in the middle of this devastation, stood our clinic strong and intact. Already waiting for me was one of my nurses, and one of our home therapy nurses, and we started cleaning and calling our patients. My RVP Chris Fonvielle was in constant contact with me, reassuring me that help was on the way, and I didn’t have to wait too long. Before I knew it, the entire Emerald Coast Management team pulled in with their arms wide open. They immediately started helping by contacting patients, so I could contact my staff, and just to let you know Joan Castles, D.O., called me every hour on the hour while my husband and I were huddled in the hallway of that hotel. How do I even begin to say thank you? Chris Fonvielle, and my D.O. Angelina Lewis, and the float clinic manager Barbara Reagan have been towers/rocks of support. So, here it is 16 days post storm and the support system Fresenius has put in place is beyond anything I ever could have imagined. All my staff have been placed in temporary housing again, for which I am grateful. Our patients and staff have been fed every day, supplies have been brought in and distributed as needed, and the love and encouragement we have received has been so greatly needed. Here in Panama City, our patients have always been loved and well cared for on a clinic level. Now they feel that love and caring from a company level, and the patients that we provided treatment for from other non-Fresenius clinics have felt that love and care as well. After Scott Riddel's team left, Mike Christiansen and his team arrived continuing the love and support that Scott's team had started. They began showing us the way to "clean up" and move our clinic into recovery mode and normalcy. They recognized needs that had not been identified early after the storm and helped us to navigate through those needs. Again, thank you so very much, you are well loved for what you have done. The "Men in Black," can we just keep them here? They are awesome, helping to find patients, welcoming us to work every day, watching over us. They have done so very much. The extra staff that the company has sent has helped in so many ways. They have allowed our own staff time to go meet with insurance adjusters, clear their houses out, and have been so kind. The people you have sent have become a part of my team. Fresenius' Disaster Response is beyond explanation. The entire country could learn a thing or two from this company. 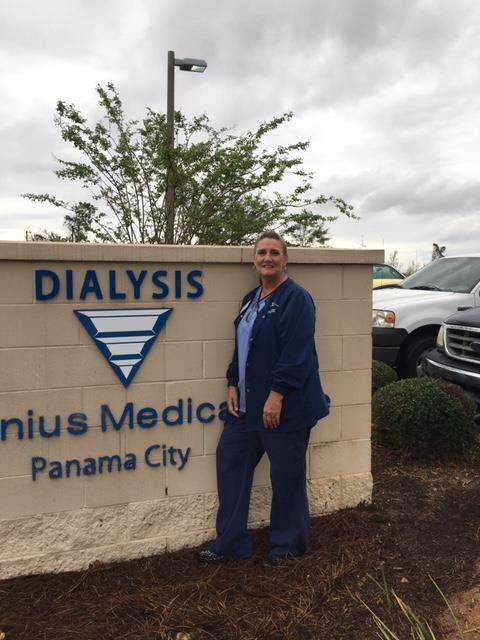 In addition to the Disaster Recovery Team, Fresenius Medical Care has several other initiatives to aid employees facing natural disasters and other hardships. The FMNCA Cares Fund provides financial assistance, our PTO Hardship Fund allows employees to donate or receive additional PTO, and Fresenius Strong, a company-wide effort to aid employees and their families in securing food, toiletries, and needed supplies like clothing and household items.